The flexibility of our Private Ice Guiding and Instruction makes this one of our most popular trip options in the winter. The world famous Ouray Ice Park is the best place to both learn new and improve your existing ice climbing skills. But the Ice Park is, as they say, only the tip of the iceberg. The options for private guided and instructional ice climbing in Ouray and the San Juans are practically limitless. Whether this is your first time climbing and would like to experience the customization available with a 1:1 private guide, or you have a group that would like to organize a few days of climbing instruction – we have the guides, the experience, and the local knowledge to put together the perfect program to suit your needs. 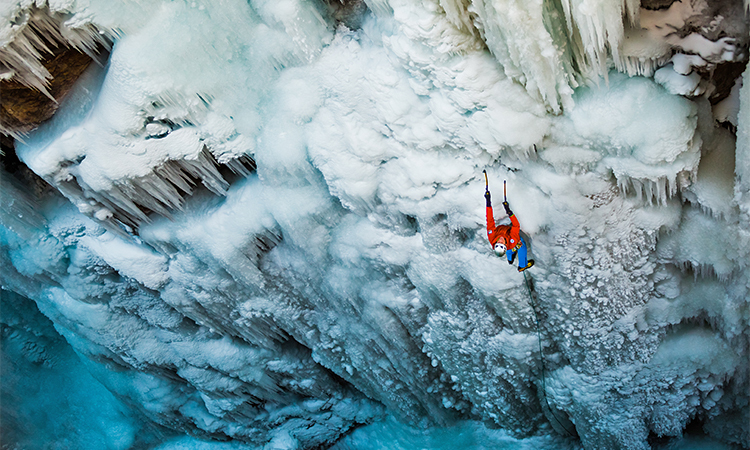 The ice climbing season starts in November and runs through March. We specialize in all forms of custom guiding and also offer the opportunity to climb all of the San Juans’ classic routes in Ouray, Silverton, and Telluride. We can organize itineraries for single day climbs, or multi-day trips that combine both instruction in the Ice Park and backcountry routes in the San Juans. No experience is required, as we specialize in working with the “never evers” to the seasoned ice climber. In addition to the Ouray Ice Park, we regularly guide ice routes in the San Juan backcountry around Ouray, Silverton, and Telluride. Please visit our Private Backcountry Ice Guiding Page for more information about routes and itinerary options. Our Private Guided programs offer you the opportunity to select any combination of days or topics. From a half day in the Ice park with your family to a multi-day progression of skill acquisition – the options are many and fully customizable to your specific needs and desires. Many of our guests opt for a series of ice climbing days in both the Ice park and surrounding Ouray/San Juan backcountry. Don’t hesitate to Contact Us to let us help you design the best program possible. 1 - 2 Large, durable bags for oragnizing and transporting your gear during airline travel etc. The Osprey Mutant 38 represents an excellent all around performer for Ice Climbing trips in the Ouray Ice Park and surrounding San Juan backcountry. Coffee is the lifeblood of champions. We highly encourage the consumption of coffee on our programs. The darker the better. We recommend wide mouth Nalgene (or similar) water bottles for the majority of our programs. Two 1 liter bottles is the standard for days in the mountains. Insulating water bottle parkas are recommended in the winter months, for ice climbing or cold weather alpine trips. Lunch begins when breakfast ends and ends when dinner begins. Bring what you like to eat and consider the length, relative difficulty, weight, and other factors when deciding what to bring in the mountains with you. A variety is always best. Don't be afraid of Mr. T.
A good pair of wrap around sunglasses are an essential item for all of our trips. When the sun shines brightly on fresh snow in the mountains your eyes will thank you for a quality pair of shades. Looking good is important too. Essential for all of our programs. SPF 30 would be our minimum recommendation. Typically a 4 oz. bottle will suffice but consider trip length when deciding how much to pack. Lip balm is important to bring on all trips. SPF 15 or higher is recommended. A headlamp is recommended for all of our programs and is an essential piece of equipment you will use in a variety of circumstances. Most LED type headlamps will do but we recommend the Black Diamond Storm for its versatility. An excellent investment for all of our programs. Our guides always carry a comprehensive medical kit but it's nice to have your own as well. A small knife is an indispensable tool to carry with you in the mountains. We like the Spatha knife for its size, weight, versatility, and ability to clip onto a harness. While phones these days offer excellent quality, nothing beats the reliability of a dedicated digital camera. You'll be glad you brought it and your guide will make sure to help capture the moment of you being awesome. An optional item, but nice to have on cold weather climbs and courses. Consider having a few stowed away in your pack and you can break them out if you feel you need them. Synthetic socks area must for all outdoor activities. Select a pair that fits well, is warm, and is comfortable. Bring 2-3 pairs depending on the type of trip. Choosing the right base layer really makes a difference in comfort, moisture-wicking, and the balance between cool and warm at the right time and in the right places. The Outdoor Research Echo Hoody also offers good sun protection. Similar to the base layer top. These are wear all the time in all conditions base layer pants. A must have for alpine and ice climbing trips and objectives. One of the best mid-weight layers we've ever worn. The Outdoor Research Deviator Hoody combines all the best features of a mid-layer into one supremely well-fitting piece of technical hybrid inner/outwear. The layer does so many things so well it's one of the few pieces we wear throughout the year. Designed specifically with Ice and Alpine Climbers in mind, the Outdoor Research Iceline Jacket will foot the bill for your workhorse soft-shell jacket of choice in the mountains. Feature rich and detail oriented, our guides love to work and climb in this jacket. The well-designed Iceline pant by Outdoor Research is the best ice climbing pant we've ever worn. All the features you've been looking for in a workhorse alpine pant in one package. Durable, quality craftsmanship and an Infinite Guarantee makes this a worthy purchase. Ice climbers know a thing or two about staying warm in all those long, stationary stretches when their partner is leading a pitch. We made the Perch Belay Parka for them (and for anyone who wants water-resistant warmth while, say, grilling burgers in a ski resort parking lot in February). Same spirit, same guts, and same award-winning hybrid-mapped design of the Cathode Hooded Jacket, minus the sleeves and hood. An insulated vest is an optional item on our programs but we do think vests offer excellent flexible layering options in a variety of circumstances, weather conditions, and trip types. Our Outside Magazine and Men’s Journal “Gear of the Year” award-winning storm shell is engineered for fast-and-light alpine climbs and all-day backcountry tours. You need at minimum either a soft shell jacket or hard shell jacket for local Ouray based winter courses and programs. Waterproof, breathable and lightweight, the GORE-TEX® Foray Pants provide dependable rain protection and shrug off the wear-and-tear of the trail and cityscape alike. The Booster’s reversible design lets you choose. The soft yarn blend will provide a cozy sanctuary throughout winter’s chill. A required item on the majority of our programs, a baseball cap helps to keep harmful sun off your face. The Radar Pocket cap is packable, durable, and looks great! Updated for touchscreen compatibility, the StormTracker Sensor Gloves are equally at home alpine climbing, ski touring or ice climbing. Low-profile GORE® WINDSTOPPER®. Soft Shell fabric deflects biting gusts, and a tricot lining retains valuable heat. Built to handle cold mornings on the up-track and powder turns all the way back down, these versatile gloves feature a new stretch nylon shell outer, a goat leather palm with textured fingertips, and a warm, quick-drying wool blend lining. Our pinnacle technical alpine climbing glove was inspired by the design of medieval gauntlets and built for elite climbers. These breathable three-in-one gloves—built with a GORE® WINDSTOPPER® soft shell outer and warm, removable, quick-drying wool blend liners—are perfect for multi-day endeavors. Simple, effective and infinitely adaptable, Original BUFF® headwear is the product that started the multifunctional headwear revolution. At its core is a moisture-managing microfiber fabric that is wind resistant and able to control odor. We recommend the BUFF for all of our programs as a multi-purpose insulation piece and trendy headgear! A belay device is a required item on any of our technical climbing or mountaineering courses. While not necessary to have the Guide ATC specifically, we think owning one of these offers additional versatility as you progress and gain additional knowledge about the various levels of functionality provided by a device of this type. The BD Aspect Harness is a great all around performer for all types of climbing - ice, rock, alpine etc. The adjustable leg loops and integrated ice clipper loops make this a solid investment as your do-all harness. We recommend at minimum 2 - 3 personal locking carabiners on our climbing courses and any technical private guided program. We prefer classic screw gate carabiners over other types of locking mechanisms. A selection of non-locking carabiners is recommended on all of our technical climbing programs. Consider at least 4 - 6 and we prefer wire gate carabiners over more traditional gate carabiners. Many options exist so just consider a variety when putting your carabiner rack together! We provide ice climbing boots at no additional charge for our Ouray based ice climbing programs. However, if you would like to invest in an ice climbing boot then look no further than the La Sportiva Nepal Cube. Another versatile option would be the La Sportiva Batura 2.0. Both are excellent choices for ice climbing and mountaineering. We provide either the Cyborg or Stinger Crampons on all of our Ouray-based ice climbing programs. However, if you are in the market for a dedicated ice climbing crampon then consider either the Cyborg or Stinger as great all around performers. This is an optional item on our programs. However, a good pair of trekking poles is a worthy piece of gear to have with you for long approaches or treks through the mountains. There are many added benefits to trekking poles. The new BD Distance series poles are light, collapsible, and adjustable. Accessory cord or cordelette material is essential equipment that offer great versatility in use and application. Consider getting a few for your climbing rack. Climbing slings or runners are an excellent compliment to your climbing gear. Versatile in their use and applicability, consider having a few of each length on your rack. As always, being in excellent physical shape is an important component of our our programs. A good mixture of cardiovascular fitness, muscular fitness, and especially core strength will help you to maximize the potential rewards that are possible on a great climbing trip. Specific to Ice Climbing – check out our Pre-Season Training Tips for helpful info on how you can prepare for the forearm pump! Familiarity with basic climbing principles such as knots, belaying, rappelling, and rock climbing technique can be very helpful for our Intro Course participants. 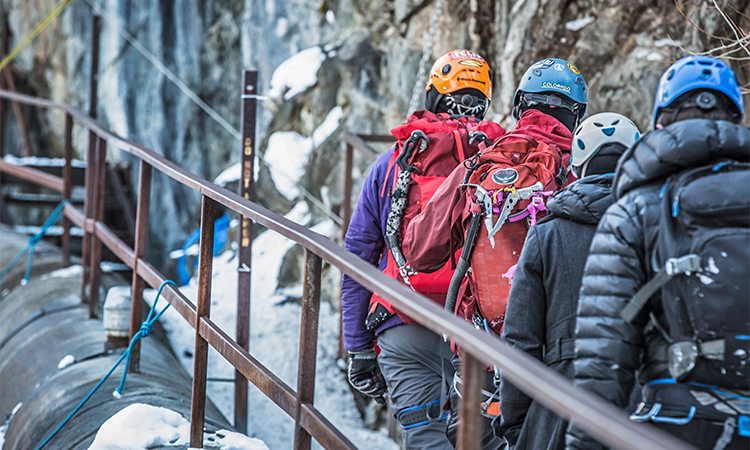 Though not required, prior rock climbing experience will help you to acquire and assimilate the information covered in our ice climbing course progression as quickly as possible. Ouray is located in the SW corner of Colorado, approximately 30 minutes south of Montrose. Known as “The Switzerland of America”, the town of Ouray is a vibrant outdoor oriented community. All local businesses are very friendly to the ice climbers who flock each winter to climb in the Ouray Ice Park and surrounding areas. The best option for flying to the area is to fly into Montrose, CO. Many airline options exist, and most connections originate from Denver, CO, however, many airlines now offer direct flights into Montrose – especially during the summer and winter months. It is also possible to fly into Grand Junction, Durango, Telluride, or Denver CO. It may be necessary to rent a car and drive to Ouray if you’d like to fly into one of these airports. Below are some approximate driving times if you’d like to drive to Ouray. If you plan on renting a car, please consider the winter weather when selecting your vehicle and at a minimum choose something that offers either front wheel or all-wheel drive. Ouray has a number of great hotels, suites, and vacation rentals for you to stay in while you’re in the area. Give our office a call at 800-642-5389 if you have any questions about what would suit you best for this trip! Advance Registration is required for this program. You have the option to either call our office and register via phone or utilize our secure Online Reservation System. All participants must read and sign an Assumption of Risks/Liability Waiver and agree to our Reservations and Cancellations Policies.